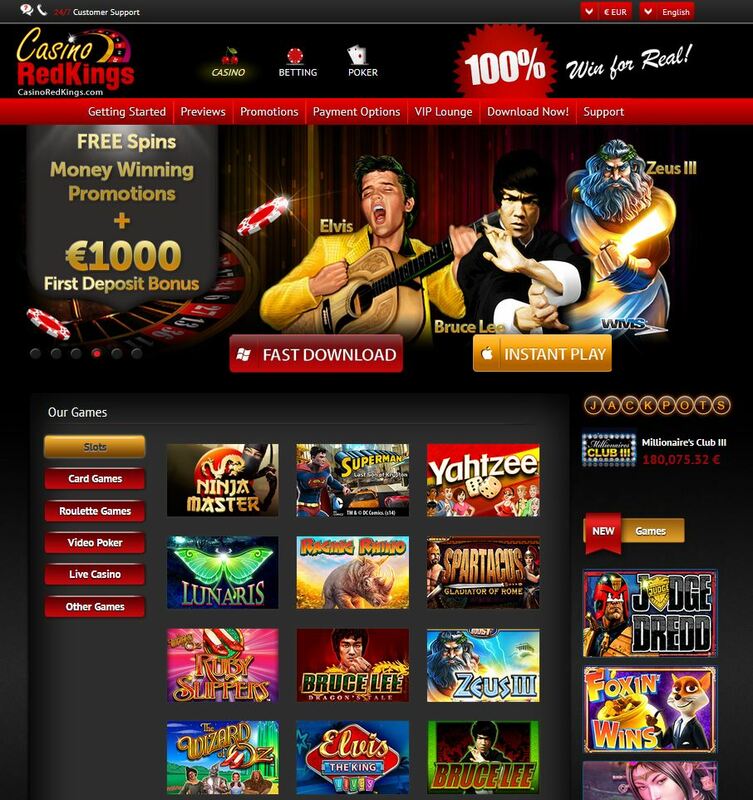 Established almost two decades ago, RedKings Casino owned by RK Operation based in Cyprus has been offering top-notch online gaming services to players cutting across several countries. Apart from the casino, there is also RedKings.com which is a superior online poker website and BetRedKings.com which offers sport betting services and also CasinoRedKings.com focusing on the casino section of the gaming empire. From the start, RedKings have signaled their intent to become one of the leading brands in the online gaming world and with a robust customer service approach, services in about 18 different languages, bonuses and promotional offers, loyalty programs and sophisticated Ongame Network, there is little to exempt them from the league of the very best poker sites globally. At RedKings Casino, there are six different deposit bonuses on offer and players are at liberty to choose between three incremental or three fixed deposits. On the incremental deposit side, options like Hearts250 where players get an additional 10 Euros each time 120 player points is collected is available. More so, players who enjoy these bonus have not more than 90 days to clear the bonus and can also deposit not lesser than 20 Euros to receive as high as 250 Euros. When combined it accrues to a 1,250% bonus. Another bonus package is the Diamonds500 which offers a 500 Euros available in 50 Euros increments once a player amasses a total of 500 points. This implies a total of 5000 points to enjoy the entire bonus in not more than 55 days. When compared to the Hearts250 bonus, 600 points are needed to earn 50 Euros with Hearts250 while Diamonds500 requires 100 points lesser. The minimum deposit to enjoy this bonus is pegged at 20 Euros but it is advisable avoid depositing lower amounts so as not to tire out before accruing enough points to enjoy the huge bonus offers. The last of the incremental bonuses is the King1000. This option increases your account in portions of 100 Euros and for each 900 points you get, an extra 100 Euros is added to the 1000 Euros limit. 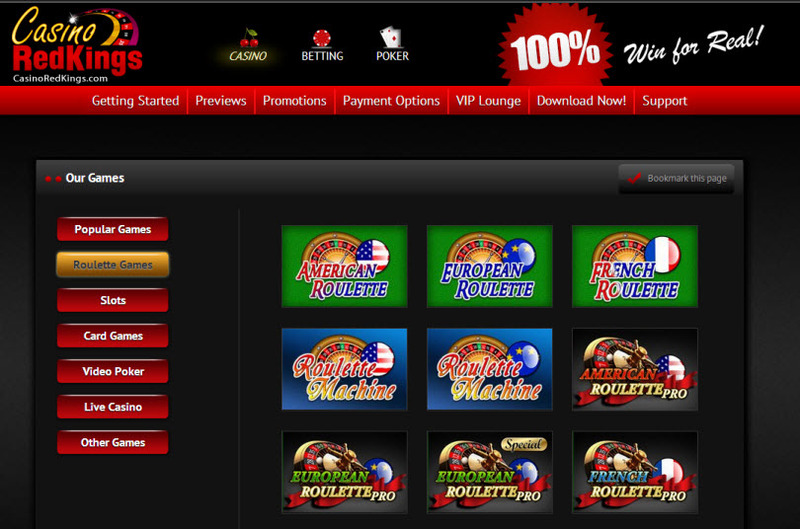 Players do not have more than 40 days to clear the bonuses and also the minimum deposit remains 20 Euros. 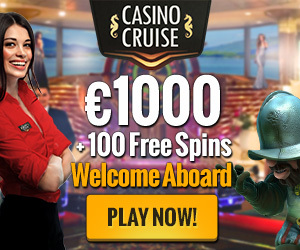 Once you amass 9000 points, 1000 Euros will be credited to your account with the casino. The three fixed deposit on the other hand are all pegged at 100% bonus on your initial deposit and are credited in a lump sum. The Kingsize1250 option affords you 30 days to clear bonuses once 1,250 Euros is deposited. It also pays 1 Euro for every 10 points earned. The Kingsize2000 gives 30 days during which the bonus must be collected but for a 2000 Euro deposit, a slightly better rate of 9 points to a Euro is activated. 12,500 points will be needed to enjoy the Kingsize1250 and 18,000 points will increase your bonus by a whopping 2000 Euros if you opt for the Kingsize2000 bonus package. The biggest of them all is the Kingsize2500 with a tremendous 2,500 Euros bonus just for playing poker at RedKing Casino. It is however important to note that this bonus although mouthwatering expires within 3 weeks. Unlike the previous fixed bonus packages, Kingsize2500 offers 8 points to the Euro so you will need only 20,000 points to gain 2,500 Euros. To enjoy any of the bonuses offered in the Kingsize series, there is the need to fully understand what it takes and how to go about clearing the bonuses. 3.6 points is awarded for every Euro staked on cash games and a Euro also to tournament fees. Assuming a player selects the Kingsize1250 option, he/she must within 30 days, garner 12,500 points which loosely translates to about 417 points daily. While playing the no-limit cash games where an average rake is usually about 0.25 Euros per pot, if you stake about 50% of the pot in every hand played, then 0.45 Euros will accrue to you. This implies that you will have to play not less than 927 hands within the 30 day period to level with the required 417 daily points. However, you can’t get every hand dealt to you, nobody does! So if you play assuming 20% of all hands dealt to you then about 4,635 hands daily is what you need to enjoy the bonus. Another twist is that if you are able to multi-table four games at a go with the same rake averagely and contribute 50% as earlier discussed then that is about 1,159 hands played per table. Let’s say 120 hands are dealt per table per hour, you could earn then 1,250 Euros in a lesser time than 10 hours per day and you could even do better if you multi-table more than four games concurrently. At the RedKing’s VIP club, there are four levels categorized by a monthly point total and three levels on a yearly point total. The Bronze level is between 0-999 points, the Silver level from 1000-2,900 points within a calendar month, next comes the Gold level with not lesser than 3000 points and not higher than 5,999 points and then lastly, the Platinum stage for earners of 6000+ points. For players interested in any of the annual VIP levels, not lesser than 6000 points must be earned each month for the 12 months prior to when they want to enroll. It is however possible to garner the required 72,000 points within a shorter period. The entry level for the yearly level is the Platinum Elite followed by the Diamond Elite tier which demands a 13, 000 points a month cache and lastly the Royal VIP reserved for those with the capacity to earn 20,000 points each month within the year. As a player rises through the ranks, several mind blowing bonuses and benefits will accrue to he/she including free-rolls which are customary for each of the levels but significantly higher depending on the level within the loyalty program. At some stage players will begin to receive special invitation to events, get extra discounts on casino merchandise, tickets to live events, a slot on the RedKings Team and in fact a special concierge service when you attain the Royal VIP level. The only currency allowed in the VIP shop are is the RedKing Crown. Each player point is equivalent to 0.72 crowns and the rate remains unchanged across all seven VIP levels. All crowns expire after six months so players are advised to redeem their crowns at the VIP shop before the six months period elapses but no need to lose sleep over crown redeeming since there are several options available at the VIP shop including using your RedKing crowns to enjoy cash back rewards, new cash bonuses, gift vouchers, t-shirts, tournament tickets, iPods, mobile phones and many more. The RedKings Poker sponsors 16 players across 12 different countries in Europe at the moment and they are looking to enlist more youthful poker enthusiast who have enjoyed continuous successes at the tournament tables. So if you make deposits at the RedKings today and you put your skill and heart to the game, one day you just might be invited the join Team RedKings. At RedKings, players who are dealt hole cards that are red kings take for instance in a Texas hold’em cash game, will automatically win 300$. A player can only enjoy this largesse only once and most have earned not less than 2,400 new points. More so, if a player loses with pocket red kings in a Texas hold’em cash game at the showdown stage, RedKings awards a 500$ prize to such player. Note that there is just a one-time eligibility also to enjoy this offer and such player must have not lesser than 4000 new points. 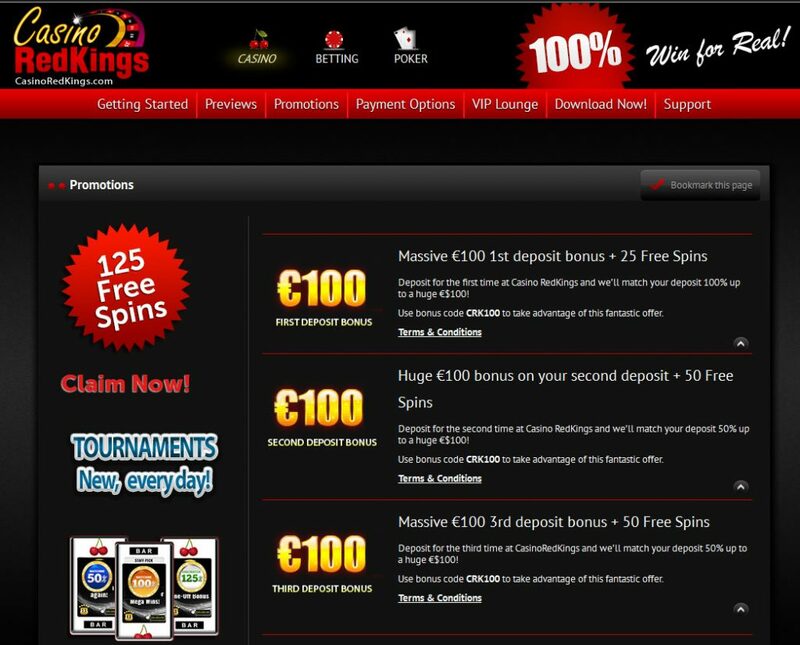 At RedKings Casino, there are six different deposit bonuses, choose between three incremental or three fixed deposits.